A planned rail route through London should be expanded as it does "so little for so few", a group of railway managers has said. The £16bn Crossrail plan was approved by the prime minister last week. It will run from Maidenhead, Berkshire, through to Essex, but the Superlink group wants it to start in Reading and terminate at Stansted Airport. 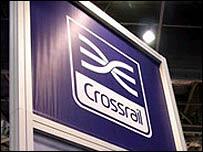 Crossrail said Superlink's proposals had been analysed by experts before the route was finalised. Construction of the route is expected to start in 2010 with trains running from about 2017. It will provide 24 trains an hour into the heart of London from the east and west, improving rail links to the West End, the City and Docklands. 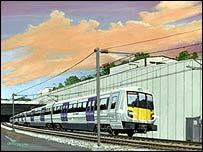 The proposed new line would also have spurs off to Heathrow and to south London. But among changes Superlink would like to see are an extension as far west as Reading in Berkshire, a link to Heathrow's new Terminal 5, and a branch line from Canary Wharf in east London to Cambridge via Stansted Airport. The group also wants to see extensions taking in Woking and Guildford in Surrey, Basingstoke in Hampshire, as well as links to Barking and Tilbury in Essex. Superlink chairman John Prideaux - a former British Rail InterCity boss - said: "We remain concerned that so much money is being spent on a rail scheme that does so little for so few. "Extending Crossrail to Basingstoke, Milton Keynes, Reading, Stansted, Cambridge, Ipswich and Southend would add about £3bn to the cost but would be more than self-financing - generating much greater passenger revenues." A Crossrail spokeswoman said Superlink had promoted several alternatives to Crossrail for many years including the longer-distance "regional" services. She said: "Compared to the Crossrail scheme Superlink's concept would be considerably more expensive, entail major environmental difficulties, offer fewer regeneration benefits and present considerable operational difficulties. "It offers limited congestion relief to the most crowded sections of the existing Underground network. "It was partly on this basis that the Crossrail scheme was submitted to Parliament in the Crossrail Bill in 2005 and it is this scheme that is now being taken forward, with full funding and full government support."